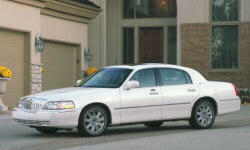 How has the 2005 Lincoln Town Car Signature held up and perfomed through the years? I have my 2004 Town Car for almost two years now and it has exceeded my expectations. The primary reason I purchased the car was for the comfortable ride and I'm so glad I did. I bought the car with 125k miles on it and it drives like a new car. Solid, quiet comfort is how i would describe it. I took it for a 3,600 mile road trip this Spring and had no issues whatsoever. The engine is peppy and can move that 4,000+ lbs into traffic quickly, without hesitation. I get about 22+mpg on the highways and about 18mpg around town. Other report better mileage, but I'm happy with it. As far as reliabilty, the car is "bullet proof". Ford built and refined the engines, bodies and drivetrains in these cars to the point where they last can last for well over 300k miles. I highly recommend this generation of T/C. For the money, you cannot get anything that can rival it. My 2005 Lincoln Town Car is a dream to drive. It already has 137,000 miles as I drive to Florida at least twice per year. It is the best car I have ever owned. I love it.